The panel2.cfg file allows to create 2D panels by defining which elements to use, like lamps, needles, etc., what they are intended to display and where they are to be placed. The panel2.cfg file is a plain text file encoded in any arbitrary encoding, however, UTF-8 with a byte order mark is the preferred choice. The parsing model for numbers is Loose, however, you are encouraged to produce Strict output nonetheless. The file is required to be located inside the train folder and is expected to be named panel2.cfg. The file is interpreted on a per-line basis, from top to bottom. All elements in the panel are associated layers. The layer is described as an integer, where small values represent the background and high numbers the foreground. When placing elements, you should make sure that no overlapping elements share the same layer number. The background image of the panel is always associated layer number 0, so elements on top of it should start with layer number 1 or higher. If you want to place elements behind the panel background image, you can likewise use negative numbers to represent these layers. For all elements that take a texture, you can specify distinct daytime and nighttime textures. Depending on the lighting conditions and additional route instructions, openBVE will display any intermediate blend between the daytime and nighttime textures. If no nighttime textures are used, the daytime images will be darkened to simulate corresponding nighttime images. Some values are further split into multiple parts, separated by commas (U+002C). The This section defines the background image to use for the panel and which resolution the panel has. Only one This section may be used within the file. Value: A floating-point number representing the width measured on the panel background image that corresponds to the width of the screen for the default camera position, alignment and zoom. Value: A floating-point representing which x-coordinate in the panel background corresponds to the farthest point to which can be scrolled left. The point is not required to lie within the bounds of the background image. Value: A floating-point representing which x-coordinate in the panel background corresponds to the farthest point to which can be scrolled right. The point is not required to lie within the bounds of the background image. Value: A floating-point representing which y-coordinate in the panel background corresponds to the farthest point to which can be scrolled up. The point is not required to lie within the bounds of the background image. Value: A floating-point representing which y-coordinate in the panel background corresponds to the farthest point to which can be scrolled down. The point is not required to lie within the bounds of the background image. FileName: The image file to use as the daytime version of the panel background image, relative to the train folder. If not specified, no background image will be shown. FileName: The image file to use as the nighttime version of the panel background image, relative to the train folder. If specified, the daytime version must also be specified. Otherwise, no nighttime version will be available. HexColor: A hexcolor representing the exact color in both the DaytimeImage and NighttimeImage files which corresponds to a transparent pixel. The default value is #0000FF. X: A floating-point number representing the x-coordinate of the panel background image that corresponds to the center of the screen. Y: A floating-point number representing the y-coordinate of the panel background image that corresponds to the center of the screen. Defines which pixel in the background image corresponds to the center of the screen for the default camera position. The relation between Center and Origin influences the yaw and pitch of the cab alignment. X: A floating-point number representing the x-coordinate of the panel background image that corresponds to the vanishing point. Y: A floating-point number representing the y-coordinate of the panel background image that corresponds to the vanishing point. Defines which pixel in the background image corresponds to the vanishing point for the default camera position. This is the point to which the two rails converge at the horizon on a straight piece of track. The relation between Center and Origin influences the yaw and pitch of the cab alignment. 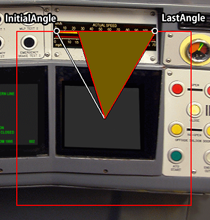 Camera restriction is the built-in functionality to limit the camera view inside cabs created by the panel2.cfg to the rectangle as specified via Left, Right, Top and Bottom. If your setup of *Center*and Resolution would force the camera to show parts that are outside of that specified region even with the default camera settings, the camera position will be altered to guarantee that the view stays inside the cab region. In order to verify that your Center and Origin setup is unaffected by this, disable camera restriction by hitting the CAMERA_RESTRICTION key (default: CTRL+R) and then reset the camera by hitting the CAMERA_RESET key (default: num 5). The Center and Origin values will now be exactly as scripted, thereby revealing possible problems in the relations of Resolution, Left, Right, Top, Bottom, Center and Origin. The PilotLamp section creates an indicator that can be made visible or invisible. You can use as many of these sections as required. The DaytimeImage is required to be specified if you make use of the PilotLamp section. The Subject used needs to return 1 if the PilotLamp is to be made visible, otherwise it will be invisible. Subject: One of the available subjects. The default subject is true. Left: A floating-point number representing the x-coordinate at which the left of the image is inserted. The default value is 0. Top: A floating-point number representing the y-coordinate at which the top of the image is inserted. The default value is 0. FileName: The image file to use as the daytime version of the indicator image, relative to the train folder. Is required to be specified. FileName: The image file to use as the nighttime version of the indicator image, relative to the train folder. If not specified, no nighttime version will be available. LayerIndex: An integer which uniquely defines this element among overlapping elements. Lower numbers represent the background and higher numbers the foreground. Elements may use the same LayerIndex as long as they do not overlap. The default value is 0. The Needle section creates a rotating element, or needle. You can use as many of these sections as required. The image used for the Needle, defined by DaytimeImage (required) or NighttimeImage (optional), will be rotated around a defined Origin and optionally scaled if Radius is used. The needle depicted in the image should be pointing up. CenterX: A floating-point number representing the x-coordinate of the center of rotation in terms of the background image. The default value is 0. CenterY: A floating-point number representing the y-coordinate of the center of rotation in terms of the background image. The default value is 0. ValueInPixels: A non-zero floating-point number that redefines the radius of the element in pixels relative to the background image. The default value is Y from the Origin key-value pair. The Y value in the Origin key-value pair defines the vertical point of rotation, but also defines the actual radius of the element in the bitmap’s own pixel coordinates. If ValueInPixels is set to a different value than this actual radius, the image will be scaled by a factor of Radius / Y, while preserving the Origin-Center relation. If you do not want to scale the image, set ValueInPixels to the same value as *Y*in the Origin key-value pair, or omit Radius altogether. FileName: The image file to use as the daytime version of the needle image, relative to the train folder. Is required to be specified. FileName: The image file to use as the nighttime version of the needle image, relative to the train folder. If not specified, no nighttime version will be available. HexColor: A hexcolor representing the color by which the images are multiplied with. The default value is #FFFFFF. Multiplies the images by the color specified by HexColor. Setting HexColor to #FFFFFF (white) preserves the original color of the images, while setting HexColor to #000000 (black) produces black images. Pixels defined as being transparent via TransparentColor are not affected. X: A floating-point number representing the x-coordinate that corresponds to the image’s center of rotation. The default value is half the image width. Y: A floating-point number representing the y-coordinate that corresponds to the image’s center of rotation. The default value is half the image height. ValueInDegrees: A floating-point number representing the angle in degrees that corresponds to the Minimum value. The angle is measured clock-wise from the 12 o’clock position. The default value is -120. ValueInDegrees: A floating-point number representing the angle in degrees that corresponds to the Maximum value. The angle is measured clock-wise from the 12 o’clock position. The default value is 120. Value: A floating-point value corresponding to the value returned by the Subject in use that should be linked to the InitialAngle. The default value is 0. Value: A floating-point value corresponding to the value returned by the Subject in use that should be linked to the LastAngle. The default value is 1000. Value: A non-negative floating-point number representing the natural frequency of an assumed undamped oscillatory system. If not specified, damping will not be performed. Defines the natural frequency. In an undamped oscillatory system, this is the angular frequency in radians per second. As soon as damping is performed, the frequency will decrease with convergence of the oscillator. A natural frequency of 0 will not allow any rotation to be performed. Higher values roughly correspond to radians per second. If specified, DampingRatio should also be specified. Value: A non-negative floating-point number representing the damping ratio. If not specified, damping will not be performed. If specified, NaturalFreq should also be specified. The DigitalNumber section creates an indicator that can switch between multiple states, useful to build up a display of decimal digits. You can use as many of these sections as required. The image used for the DigitalNumber, defined by DaytimeImage (required) and NighttimeImage (optional), is comprised of the individual states, which are stacked vertically, anchored at the top of the image. The width of a single state is equal to the width of the image, while the height of a single state is defined by Interval (required). The Subject used needs to return an integer from 0 (first element) to n-1 (last element), where n is the number of elements. If a value outside of that range is returned by Subject, the DigitalNumber will be made invisible. FileName: The image file to use as the daytime version of the DigitalNumber image, relative to the train folder. Is required to be specified. FileName: The image file to use as the nighttime version of the DigitalNumber image, relative to the train folder. If not specified, no nighttime version will be available. Height: The height of a single state in the images in pixels. Is required to be specified. The DigitalGauge section creates a solid-color square of which only a radial section is shown at a time. You can use as many of these sections as required. There are three important angles to consider. The InitialAngle defines which angle corresponds to the Minimum value, while LastAngle defines which angle corresponds to the Maximum value. The current value at a given time corresponds to the current angle. The solid-color square will only show the part that is between the current angle and the LastAngle. If InitialAngle is less than LastAngle, the solid-color square will wind clockwise. If InitialAngle is greater than LastAngle, the solid-color square will wind counter-clockwise. The subject needs to return a value that meaningfully works together with the Minimum and Maximum settings. CenterX: A floating-point number representing the x-coordinate at which the left of the image is inserted. The default value is 0. CenterY: A floating-point number representing the y-coordinate at which the top of the image is inserted. The default value is 0. ValueInPixels: A non-zero floating-point number representing half the edge length of the solid-color square in pixels. Is required to be specified. If Radius is negative, it is treated as if it was positive, but the entire LED is rotated by 180 degrees. HexColor: A hexcolor representing the color of the solid-color square. The default value is #FFFFFF. The absolute difference between InitialAngle and LastAngle may not exceed 360 degrees. Value: A floating-point value representing the step in which values on the solid-color square can increase. The value to be displayed via the solid-color square will be rounded down to the next integer multiple of Value. If Value is negative, values will be rounded up to the absolute value of Value instead. If Value is 0, increases will be smooth. The default value is 0. 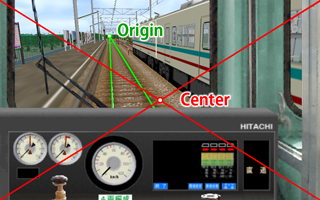 The LinearGauge section creates a panel layer, which uses texture shifting to create a sliding linear gauge. You can use as many of these sections as required. As you can see, the horizontal texture-coordinates upon this face are 0 at the right and 1 at the left. Thus, the value given by Minimum represents 0 Maximum, represents 1, and the current value may then be calculated as a simple percentage. Further, the direction of the texture shift may be changed from horizontal to vertical (or both) by using the Direction parameter. Value: A floating-point value corresponding to the value returned by the Subject in use. The default value is 0. Value: A floating-point value corresponding to the value returned by the Subject in use. The default value is 1000. XDirection: -1: Translates from right to left 0: No translation is performed 1: Translates from left to right. The default value is 0. YDirection: -1: Translates from top to bottom 0: No translation is performed 1: Translates from bottom to top. The default value is 0. NeedleWidth: An integer which defines the width in pixels of the needle, from the edge of the texture- Translation of the texture will stop when this reaches this number of pixels from the end, in order to avoid wrapping around. The default value is 0. The Timetable section defines where to place custom timetables. The actual images are loaded via the route file. Only one Timetable section may be used within the file. ValueInPixels: A positive floating-point number representing the width of the timetable measured in terms of the background image. Is required to be specified. ValueInPixels: A positive floating-point number representing the height of the timetable measured in terms of the background image. Is required to be specified. HexColor: A hexcolor representing the exact color in both the daytime and nighttime versions of the timetable which corresponds to a transparent pixel. The default value is #0000FF. A subject is composed of a base subject and an optional subject suffix. The subject controls what information is fed to the element that uses the subject. For example, a Needle can use the subject kmph to be fed with the current speed of the train in kilometers per hour, or with the mr subject to show the main reservoir pressure. acc Returns the (signed) acceleration of the train in meters per second squared (m/s²). atsi Returns the state of the ith plugin variable, depending on the plugin used. This is the same as pluginState[i] in animated objects. For the built-in safety systems ATS and ATC, see below. locobrakecylinder Returns the pressure of the brake cylinder on the driver’s car in kPa (1000 Pa). bc Returns the pressure of the brake cylinder in kPa (1000 Pa). locobrakepipe Returns the pressure of the brake pipe on the driver’s car in kPa (1000 Pa). bp Returns the pressure of the brake pipe in kPa (1000 Pa). brake Returns the currently selected brake notch. For trains with automatic air brakes, 0 represents RELEASE, 1 represents LAP, 2 represents SERVICE and 3 represents the emergency brake. For trains without a hold brake device, 0 represents released brakes, i represents brake notch i and n+1 represents the emergency brake, where n is the number of brake notches the train has. For trains with a hold brake device, 0 represents released brakes, 1 represents the hold brake, i+1 represents brake notch i, and n+2 represents the emergency brakes, where n is the number of brake notches the train has. locobrake Returns the currently selected Loco Brake notch. csc Returns 1 if the const speed system is currently active and 0 otherwise. door Returns a value between 0 (open doors) and 1 (closed doors). doorli Returns a value between 0 (open) and 1 (closed) for the left doors of car i, or 2 if the car does not exist. Car index 0 represents the first car in the train, and n-1 the last car, where n is the number of cars in the train. doorri Returns a value between 0 (open) and 1 (closed) for the right doors of car i, or 2 if the car does not exist. doorbuttonl Returns 1 if the left door button is currently pressed, 0 otherwise. doorbuttonr Returns 1 if the right door button is currently pressed, 0 otherwise. er Returns the pressure of the equalizing reservoir in kPa (1000 Pa). hour Returns the integer part of the current hour. kmph Returns the absolute speed of the train in kilometers per hour (km/h). min Returns the integer part of the current minute. motor Returns the acceleration which the motor of the first motor car currently generates in m/s². mph Returns the absolute speed of the train in international miles per hour (mph). mr Returns the pressure of the main reservoir in kPa (1000 Pa). ms Returns the absolute speed of the train in meters per second (m/s). power Returns the currently selected power notch. This is an integer between 0 and n, where n is the number of power notches the train has. rev Returns the currently selected reverser position. 0 represents backward, 1 represents neutral and 2 represents forward. sap Returns the pressure of the straight air pipe in kPa (1000 Pa). sec Returns the integer part of the current second. true Always returns 1. This is useful for the PilotLamp element in order to always show the associated bitmap. Klaxon Returns the currently playing horn (if any) as follows: (0) No horns are playing (1) The primary horn is playing (2) The secondary horn is playing (3) The music horn is playing. Note If multiple horns are playing, the lowest value will be returned. PrimaryKlaxon Returns 1 if the primary horn is currently playing, 0 otherwise. SecondaryKlaxon Returns 1 if the secondary horn is currently playing, 0 otherwise. MusicKlaxon Returns 1 if the music horn is currently playing, 0 otherwise. di With d0 for the ones, d1 for the tens, d2 for the hundreds, etc., this suffix returns a value between 0 and 9 corresponding to the respective digit of the underlying subject, but only if the value of the subject is less than 10 for d1, less than 100 for d2, etc., otherwise this suffix returns 10. Example: kmphd1 can be used to feed a DigitalNumber with the tens of the current speed of the train in kilometers per hour. The image used by the DigitalNumber will thus need to be composed of images from 0 to 10 in order to show all possible states kmphd1 can return, where images 0 through 9 correspond to the digits, and 10 corresponds to an image shown at the tens when the speed is below 10 km/h (e.g. another 0-digit, or blank space).